SPA as name suggests, it’s an application where all associated pages of any application are lay down over a single web page. In another words the entire necessary resources such as html page, style sheet, java script files, of any application is loaded in the browser after first request and rendered when requested. In simple words, it is a combination of different standard java script libraries such as Knockout, RequireJS, jQuery, which helps us to build less time taking, responsive UI for better user experience. when I was implementaing clien side framework then faced a number of problems with the configuration of view with view models, knockout.js, require.js, css and many more thing. Then found durandal, a framework which provides all nacessary configurations which is require to start a new project without putting much effort with respect to configuration. In generally Single page application, client side data model connect to the service layer for sending and receiving JSON data by using Ajax call. In this demo, we are not going to touch any server side component; rather we would be completely focus on client side component. Going to make a simple menu controls with sub menu options; which will load view dynamically on each submenu click. 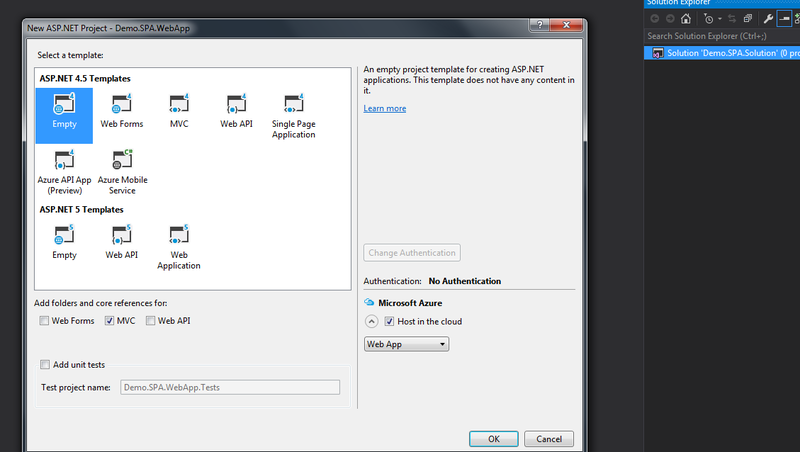 Import Durandal framework to Web app. Create view and view model. Bind view to the respective view model. Bind view and view model with dynamic data. Load views dynamically when necessary. Interact different to view with single page. Step1. Create a solution name Demo.SPA.Solution. 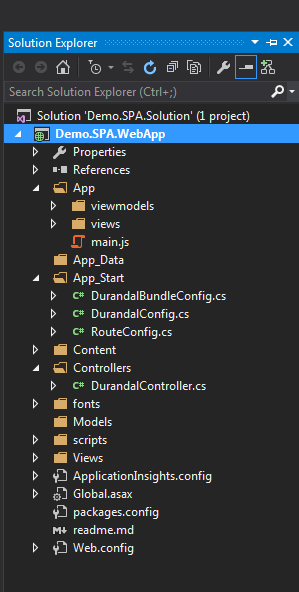 Note: - shell.js under App\ViewModels will be used to define routing. To remove this tabe you need to comment the below lines in shell.js. Going forward to our sample application. Step6. 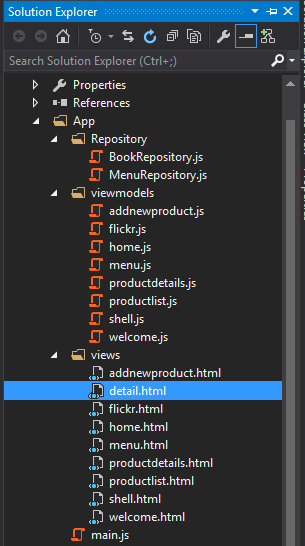 Add viewmodels with same name as html (eg: home.js, menu.js..) inside app/viewmodels folder. I have create a folder called Repository, which will take care of data part, since we are not including any server side implementation in this demo. In BookRepository.js and MenuRepository.js I have defined some variable and method which we will use further down the application. by doing this we can access the variables and functions of MenuRepository.js to this page. Menu data we will store in it obserbable array and bind it to the view. Hence respective data will appear on the web. Here we are using an important knockout binding concept called compose. Here in html you can see I have used two data-bind, in the first case compose is using static defined view and view model , however in the second one its observable which load view\view model dynamically whenever observable variable value changes (check in home.js). Rest of the pages I have also designed by using the same kind of logic, you can check by downloading sample. I want to browse home page on the page load so will define the routing as below in shell.js file. In this article, we have discussed about how to use durandal in web app. This article I am writing by keeping beginners in my mind. Hope this article will be fruitful for you. I upload this sample project with some more features along with this article.You can just download this sample code and make your understanding more better on these concepts and implementation further. XXXX is the port number of your local system on which application is running. I am a programmer by my passion and senior developer by profession. It always makes me feel better to play with programming codes and new technologies. I have worked on a number of Microsoft technologies such as Biztalk Server, SSIS,SSRS,ASP.Net,WCF. Upcoming Microsoft technologies always encourage me learn and play more with them.